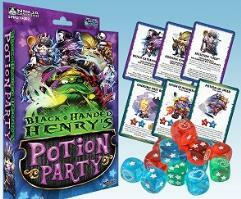 Black-Handed Henry's Potion Party is a dice matching game for 2-4 players, using the Super Dungeon dice. Players assume the role of a captured alchemist, trying to complete Captain Henry's portion before the others. Of course, as bad guys, a little sabotage may be in order.